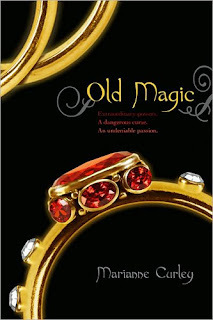 The Compulsive Reader: Cover Talk: Old Magic Gets a New Look! I do believe I have already extolled the virtues of Marinanne Curley's books here, but if you missed that post, here is the break down of the books: her YA trilogy, The Guardians of Time trilogy, is about a secret society of time travelers, and is quite fantastic, and her standalone novel, Old Magic, is a romance with some time travel action as well. 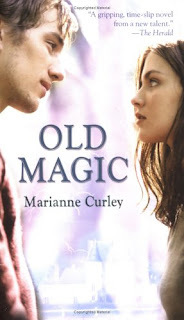 I've always enjoyed the old Old Magic cover because it seemed romantic to my pre-teen mind (which is when I first read it), and it always seemed like you could just feel the tension between the two main characters by simply looking at it. Last night, I was wandering through the disheveled book aisle of my local Meijer when I discovered that Old Magic has gotten a dark, sophisticated new facelift! I do like it. It's quite different from the original, but I also think that it does fit in more with what is popular among YA paranormals, and hopefully it's re-release will prompt more teens to read this awesome book, and Curley's trilogy! I just bought it because of the new cover. Never noticed it before. I hope I enjoy it. Thanks for the spotlight! I acquired it because of the old cover, which is the one I read,none the less I can appreciate the new cover. The author wrote a trilogy. I might need to look that up. I haven't heard of this one or the author before, but it does sound like my kind of read. I kind of like the old cover better though. I agree. I saw the new cover a while back and loved it. I think it will appeal to more people. I like the new cover, even if it is a little Twilight-esque. I'm sold--I've just requested Old Magic from the library! We had the original book with the old cover at our library, but it got weeded out in our last big weed and I had forgotten about it. I had wanted to read it and one of my teens told me she had enjoyed it. I'm glad they re-released it because I was able to find it again! I read this book a couple months ago and really liked it. I loved the old cover, because just like you said-you can feel the attractiion between them. I also like the new cover, probably not as much though. I like both covers, but I think I'm drawn more to the newer cover. It may be because it's in line with the paranormal trend, or just because there are no people on the cover. When there are people on the cover, I feel like I have to force myself to see the characters that way. I've never seen this book. Thanks for sharing!